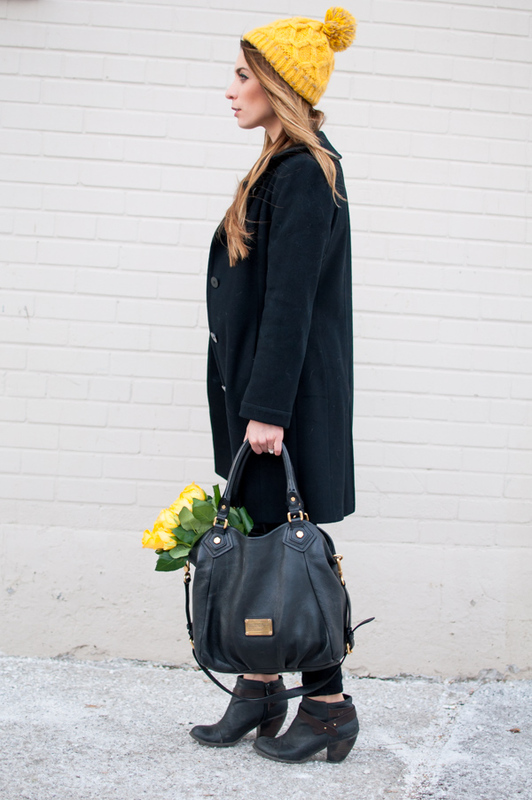 OOTD - Black Over Coat + Mustard Accents | La Petite Noob | A Toronto-Based Fashion and Lifestyle Blog. Is there anything better than a timeless coat? As much as I've been having fun this season with faux-fur, I really enjoy the clean lines of a classic wool coat. This is an outfit that has been on repeat pretty much all weekend on account of it's simplicity and warmth. 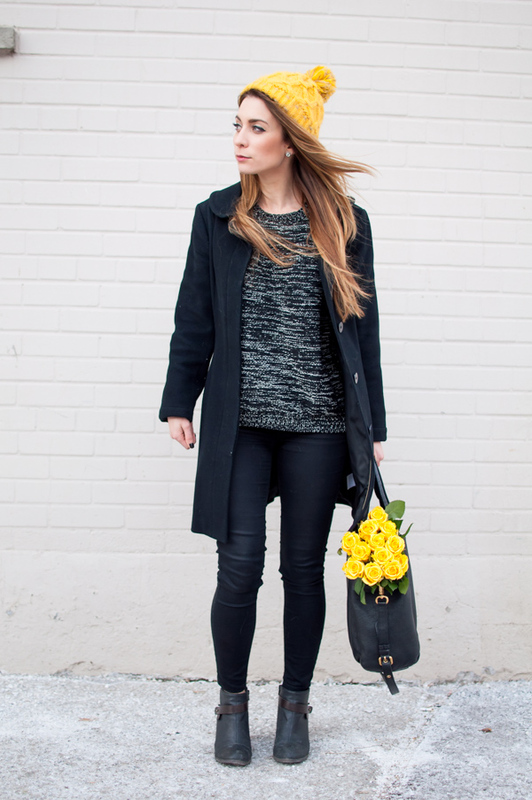 I subbed out my favourite black beanie for a bright mustard, and I love the pop of colour it brings to an otherwise very neutral outfit - plus the fact that it matches my weekend flowers doesn't hurt! Read on for outfit details and more photos. This coat was purchased over 7 years ago and is still one of my go-tos - another argument on why it pays to invest in quality items! I love it's oversized feel, and how it adds a more formal aspect to a very casual sweater and jeans. I've been on the hunt all winter for a good-quality wool camel coat, but have come out empty handed. Does anyone have any leads? I love weekend style for its comfort and simplicity. 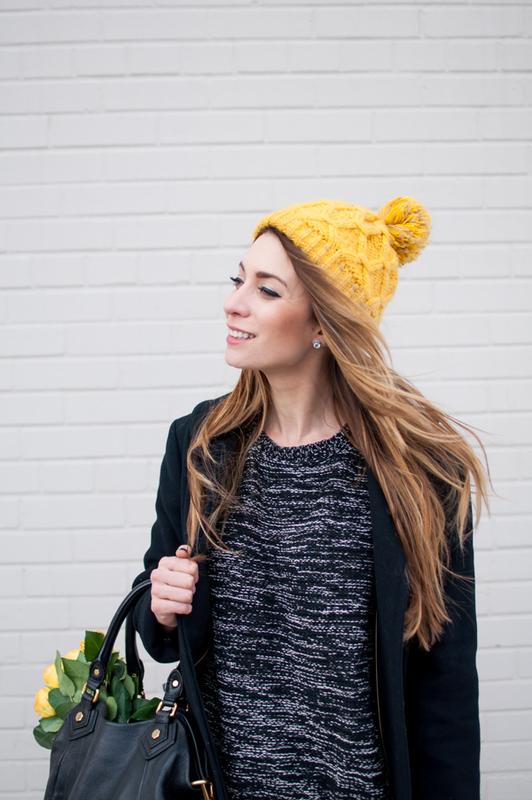 What does your Winter Weekend style look like? That sweater looks so cozy!! I invested in a really good long overcoat this year as well, and hope it will last for years. I've come up empty handed on camel coats too :(. I really wanted a good quality wrap one, but everything I found was either cheap feeling or they didn't have my size. The hunt continues! Exactly the same problem that I had! Where are all of the camel coats?! I bought a camel wool coat from Soia & Kyo last year and I love it! I get compliments all the time when I wear it. It is similar to this one http://www.soiakyo.com/ca/en/leila-long-fitted-oxblood-wool-winter-coat-for-women-with-large-collar (side zip, large neck - but it was camel). Gorgeous coat! That's almost exactly what I've been looking for! I'm totally kicking myself for starting to look so late in the season, I have a feeling that is why I had so much trouble finding a camel coat. Thanks so much for sharing with me! This is such a cool look. 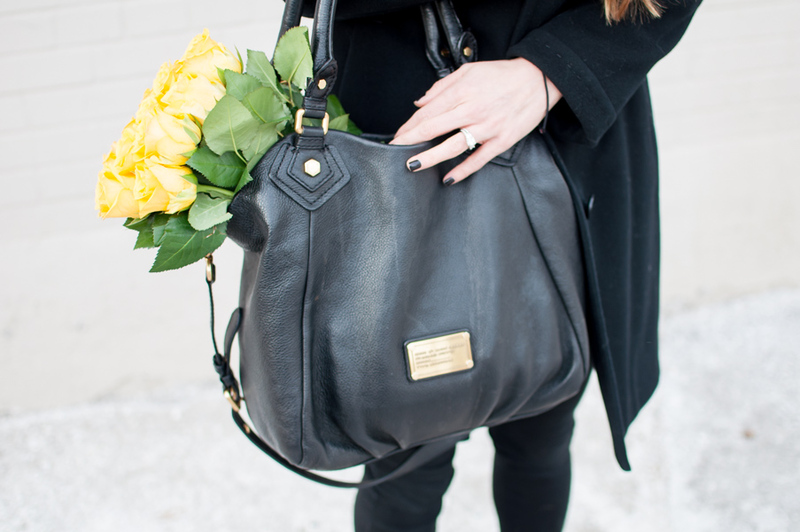 I love the pops of yellow, especially in the flowers! love the beanie! Target is the best! Isn't it? Too bad they're leaving Canada :( Oh well, more stateside shopping for me! I have the same bag and I love it! Isn't it great? I find it a bit heavy sometimes, but the quality can't be beat!